Thank you Marc, great pun! The interior belongs to the aircraft and as it's visible from the cockpit and the exterior, so I thought ... hmm ... why not. 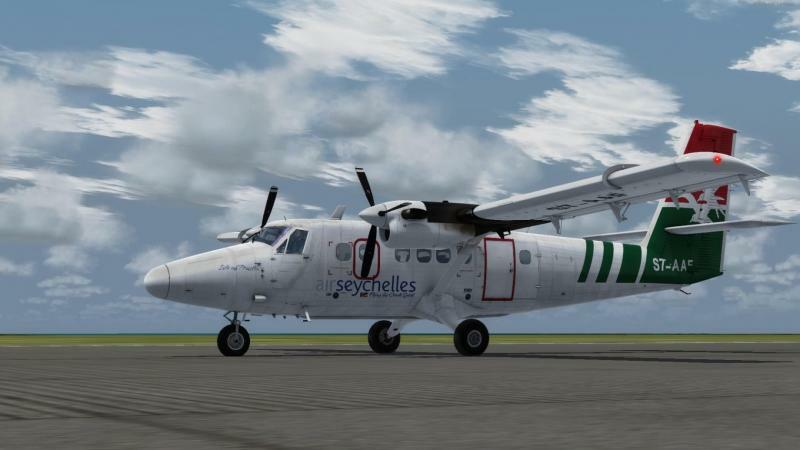 There are even more Air Seychelles liveries on it's way! This is an early preview! Your inside textures makes me do a flight (fsrecorder enabled) then, I replay flight as a "pax"
Good to hear you are back Daniel. If younget bored here is the new Viking -400 which will be operating on the Loganair/Flybe routes later this year. Would be grreat to see that recreated. I'm sorry but I don't work on requests anymore. I'll have a look but no promises. I want to ask you something, then you are nor forcel to answear, to you "draw" your livery on a tablet? (as one of you pics show) what are the software/apps used (does they are freeware/payware? I don't got a regular like you say tablet or app, it's neither Apple nor Samsung nor whatever. It's a professional graphic tablet built for drawing and picture editing only! I bought a Wacom Intuos Touch 5M which is around 300 Euro. It's perfect for a hobby guy working on a professional level. There are even cheaper ones available for beginners, just search for "Bamboo Series". The tablet I got itself don't displays the pictures you're drawing. Therefore you can get a special graphic display tablet, but those start at about 800 Euro which in my opinion wasn't worth to get. As software I'm using Adobe Photoshop CS5.1 which is around 1300 Euro. I hope that answers your question if it's freeware or payware. Just to say it's my hobby and I don't get paid for what I do! Oh and Niklas thanks for answering the other question! Thanks, Marc! :-) I'm trying to help where I can but thank more Daniel, he's doing a way bigger and much more important part for this forum! I still got a long list of liveries I planned to do sometime (all in all it's a list of 400 bookmarked links to exterior and interior photos of the Twin Otter). Pegasus and Seabird Airlines is on that list but as Marc already pointed out I'm not working on requests anymore. Texturing the Twin Otter is just a side thing I do apart from studying and developing my first payware scenery, which will hopefully be finished the next 2-3 months. Texturing the Twin Otter is just a side thing I do apart from studying and developing my first payware scenery, which will hopefully be finished the next 2-3 months. Looking forward to that as well. In what area is your scenery?